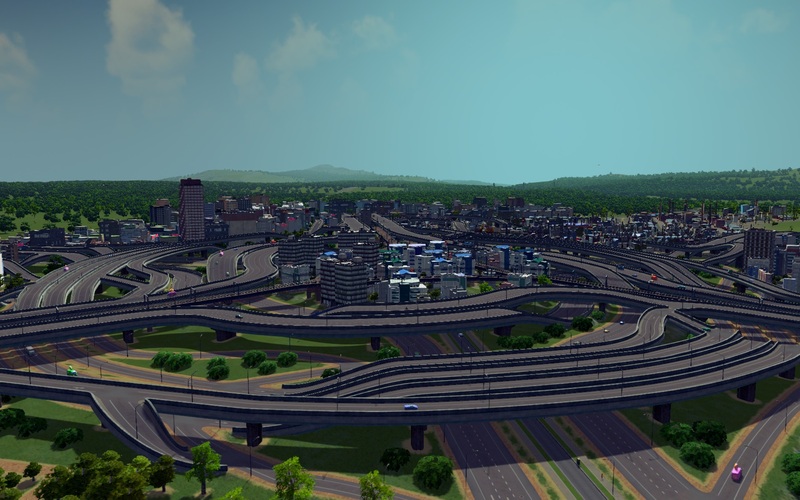 Cities: Skylines has become the heir apparent to the SimCity legacy. This is the game that the 2013 SimCity should have been, and while I’ve had years of great times with Maxis games, I’m glad to have a new place to scratch my simulation itch. To me, the heart of a city simulation is transportation, and this game does not disappoint. After getting used to the tools available to me, my first major highway project was a traditional turbine interchange (with an extra road running down the middle of the east-west highway). One of my favorite things about a turbine interchange is that lacks the weaving of a cloverleaf without the height of a stack interchange. If done right, a turbine can be accomplished with only two levels of road at any given point: a road on the ground with a single level of bridge over it. Not satisfied with a mere two-highway turbine interchange, though, I decided to see if I could expand it to work with a three-highway interchange and still keep the whole thing at two levels. I succeeded, and the result was the following beautiful monstrosity. The first complication was just placing the three highways themselves; even without ramps, having them all meet at the same place would result in three levels of roadway. I introduced a bulge in the highways, so they all circled around the center in their own rampless mini-turbine. This had the advantage of leaving a space in the middle of the interchange, which I used to create an interchange of three highway median train tracks (upper level) and a small office district accessed by three highway median roads (lower level). The ramps themselves weren’t conceptually difficult to build; it just took a lot of dime due to their sheer quantity. In a traditional turbine interchange, each ramp needs to go two places (a ramp leaving the northbound highway needs to connect to the eastbound and westbound highways, for example). 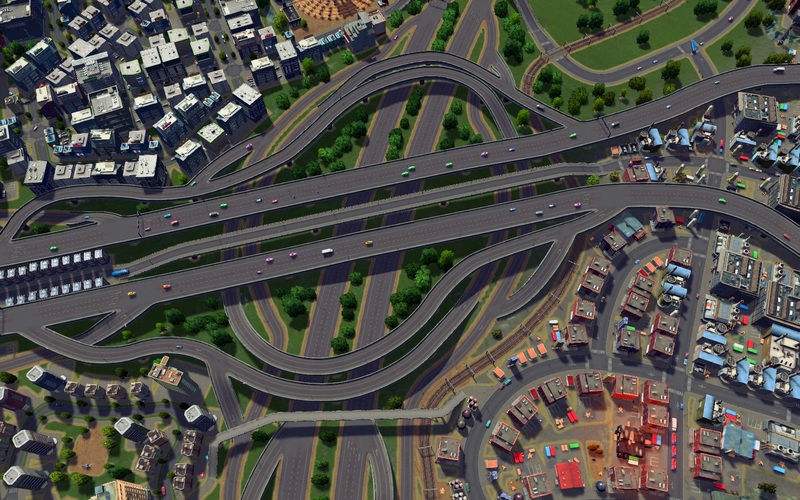 With my three-highway, six direction interchange, each ramp needs to connect to four other directions – every direction except straight ahead (because straight traffic just remains on the highway) and the exact opposite direction (because we’re assuming nobody is trying to do a U-turn in the interchange). Thus, I ended up with bundles of four ramps at each of the six ramp-highway crossings. But I succeeded! The entire interchange, including the extra train lines and central office district access roads, is never more than two levels. 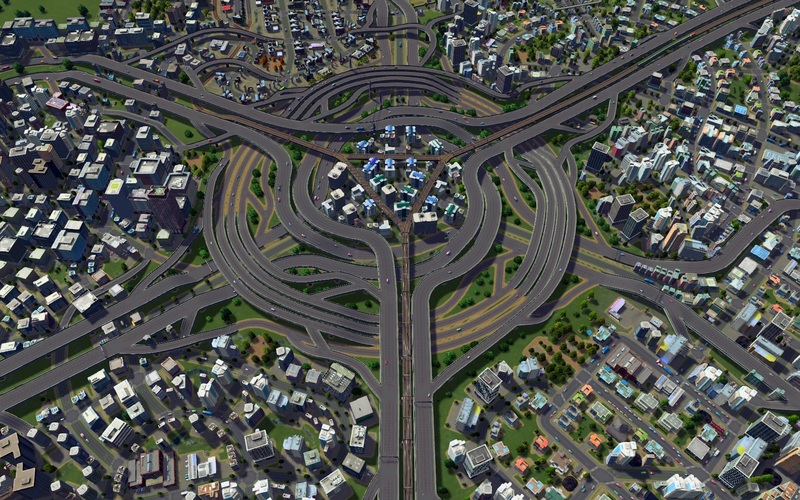 A very complicated, but very flat interchange. The intersection looks complicated, but it works well, and it’s mesmerizing to watch the simulated traffic drive around it.